July 12th, 2016 By: GGT Category: 2017/03 release, Figure News. 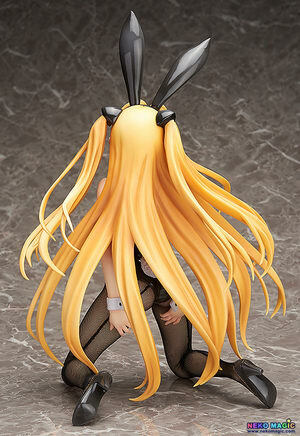 FREEing is going to release the B-Style Golden Darkness (金色の闇/ Konjiki No Yami) Bunny Ver. ( バニーVer.) 1/4 PVC figure from the manga/anime “To LoveRu Darkness” ( To LOVEる－とらぶる－　ダークネス). Will be released in March 2017. Around 340mm tall, 22,037 yen. From the popular series ‘To Love-Ru Darkness’ comes a collection of the girls wearing bunny girl outfits! The second in the series is Golden Darkness wearing a black bunny girl outfit that contrasts her golden hair beautifully for an effect true to her name. Even though she has a rather unconcerned look on her face, she is in a pose that reaches a new scale of sexiness for fans to enjoy! The figure is an impressive 1/4 scale in size and features net tights made from actual fabric for a more realistic appearance filled with highlights to enjoy! Be sure to display her with the previously announced Momo Belia Deviluke: Bunny Ver. and create your own To Love-Ru bunny girl harem!